It’s Easter Week, y’all and I’m thrilled to be to sharing my Waldorf Salad Apple Baskets as part this year’s #EasterSweetsWeek event hosted by Angie from Big Bear’s Wife. 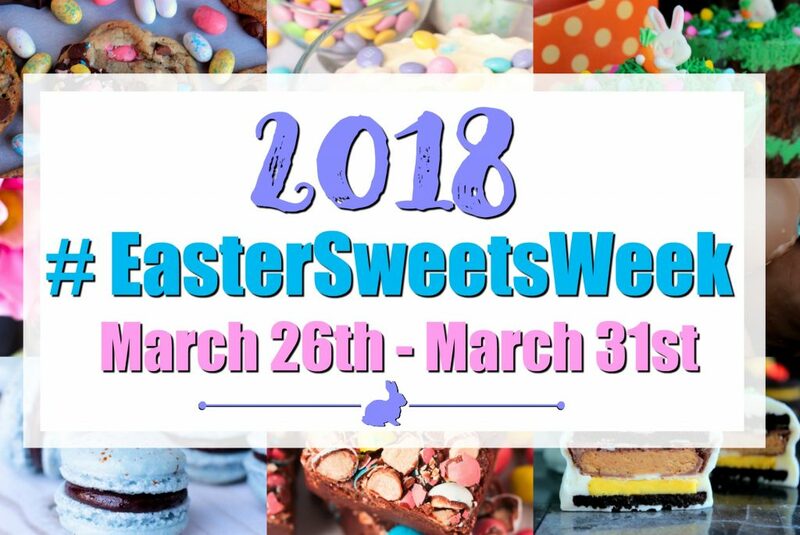 Disclaimer: These posts and recipes are part of the week-long event, #EasterSweetsWeek but all opinions are 100% mine. I am so glad that you’rev joining us for this week-long event of Springtime and Easter dessert recipes! We will be sharing tons of treats this week plus a few fantastic giveaways! You’re going to love what we have in store for you. 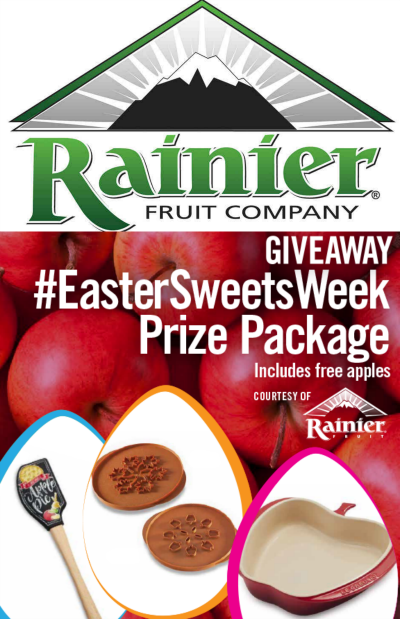 Now, I totally understand that most of what you’ll see this week will be cakes and cookies, but you guys I simply couldn’t help myself when Rainier Fruit sent me a case of the most delicious red apples I have ever experienced. Traditionally, when I think of apple desserts I’m thinking of Fall baking; cobblers, pies, and my favorite apple crisp recipe. But, as I was looking at my apples, it dawned on me that they could easily be transformed into the most charming apple “baskets” with just a little bit of creativity. And we all know that I like to hollow out and stuff my food. Take these pepper poppers or these stuffed peppers for example. Oh, and don’t forget about these zucchini boats! I could probably write another cookbook dedicated to food used as serving vessels. But that’s not what this week is about. This week is about providing you with recipe inspiration worthy of gracing your Easter Sunday dinner tables. And thus, I’m kicking off the week with my Waldorf Salad Apple Baskets. The Waldorf Salad, made famous by the Waldorf- Astoria Hotel in New York City originally consisted of equal parts chopped apples, celery and mayonnaise. Later, walnuts were added and over time it’s been embellished and modified to fit individual tastes and flavor preferences. My salad contains no celery. And if we’re being honest, my instructions will tell you to add raisins into the creamy mixture but technically, I don’t add those until I add the walnuts because my husband despises raisins. It works out, though because I just eat his portion of raisins because duh, raisins are good for you. Spread the walnuts on a baking sheet and bake for about 8-10 minutes. Allow to cool, then break into small pieces. Whisk the yogurt, mayo, honey, cinnamon and lemon in a large bowl and season with pepper. Halve, core and cut apples into cubes, leaving the skin intact. Chop the grapes in half, too. Add the apples, raisins and grapes to the bowl, sprinkle lemon juice then toss the dressing. When ready to serve, toss walnuts onto the salad. Arrange lettuce leaves and place salad on top to serve. You want to make the salad several hours before you’re ready to serve it so that everything has a chance to chill. Now, to make your apples into baskets, you’ll use a paring knife and cut into the tops of the apples. I used a tablespoon to scoop out the interior once I got the tops cut off. Cut a piece of brown paper bag into 1-inch strips by about 5-6 inches or so and fold in half once more. This will be your basket “handles”. You could probably get super fancy and braid the brown paper bag strips but my genius ran out after discovering I could turn the apples into something Easter appropriate. To secure the handles, I just chopped some toothpicks in half and secured each side with those. Easy peasey. Add some lettuce “grass”, and scoop your Waldorf Salad right inside. You’ve got salad you don’t need a bowl for. You’ve got a salad side dish that is going to win the Easter Sunday dinner prize ribbon. My job here is done, now go win yourself some fabulous prizes from our generous #EasterSweetsWeek sponsors. There are 28 fantastic bloggers participating in this year’s Easter dessert event. Throughout the week we will be sharing tons of great Springtime and Easter themed dessert recipes with you. With over 75 sweet dessert recipes being shared this week we just know that you’re going to want to save some of these recipes to make again and again! We even hope that some of these recipes end up in your Easter recipe keepsake collection! Plus, don’t forget that we have 5 (five) great giveaways for you this week thanks to our amazing sponsors! 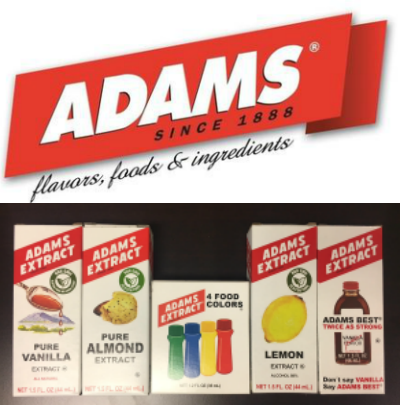 Prize #2 — Adam’s Extract is giving one (1) winner 5 different extracts including a bottle of Pure vanilla and a color pack. Giveaway open to US Residents 18 years or older.. All entries will be verified. No PO Boxes Please. Prizes will be sent directly from sponsors to winners, bloggers are not responsible for prizes. 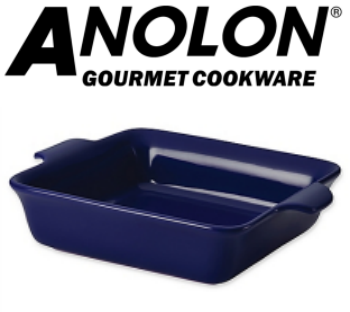 This giveaway runs from March 26th – April 1st at 12AMEST. Winners will be selected soon afterward and contacted by e-mail. Winners will have 48 hours to respond or a new winner will be chosen. There are a total of 5 (five) prizes and therefore we will have a total of 5 (five) winners. No purchase necessary. Void where prohibited by law. 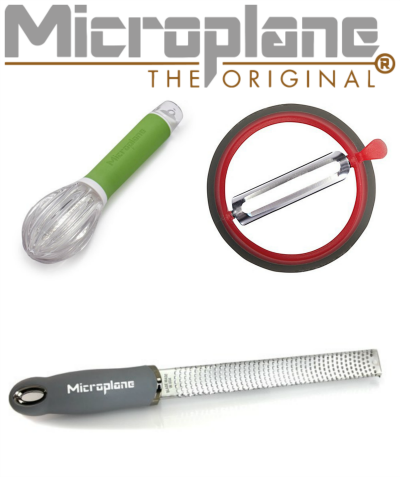 We would like to thank our amazing sponsors: Dixie Crystals, Adam’s Extract, Rainier Fruit, Anolon and Microplane! These wonderful sponsors provided the prize packs for our giveaways and also sent samples and products to the #EasterSweetsWeek bloggers to use in their recipes. Adoreable….but thr “pin” just took me to pinterest and not to the actual basket. Oh my gosh stop it, these are too cute! So fun, right?! Thank you so much! These are just the sweetest, freshest baskets that I’ve ever seen. What a cute idea! And yes to the raisins!